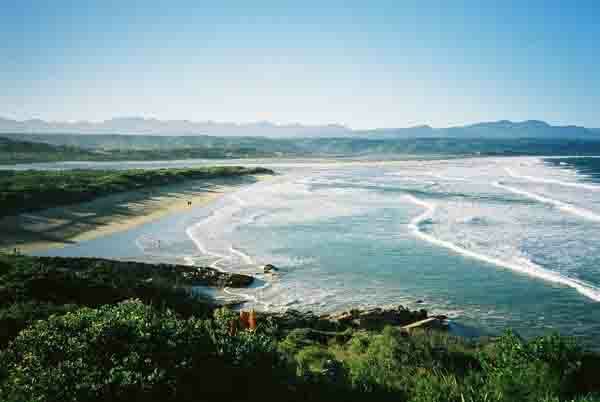 Plettenberg Bay is a town situated on the coast of South Africa in the middle of the Tsitsikamma Forest area. This stretch of coastline is very rugged with many rocky outcrops and deep valleys with rivers flowing down them. The town is situated on one of those rocky outcrops and as I have said in previous articles has a river on each side of the peninsula. The town itself is very small with many of the shops situated in the main road. Above the main road is the older residential area and below it on the slopes that run down to the sea are some of the newer houses and hotels in Plettenberg Bay. Marine Drive is the link road from the N2 into town and if you continue down it past the main road you get one of the most beautiful views you could wish to see. In front of you surrounded on three sides by water is the Beacon Isle hotel. It is built on what used to be an island and a whaling station. The views from the hotel out to sea and towards Robberg are fantastic. 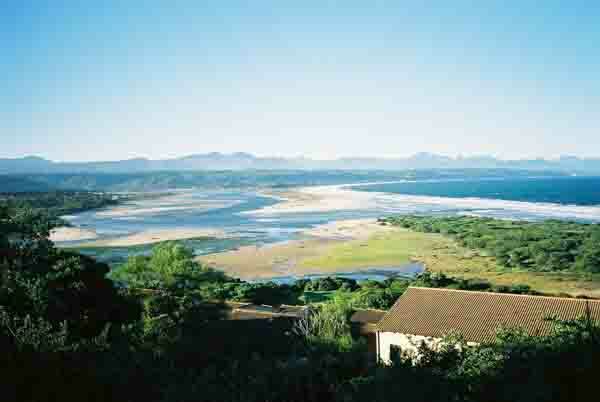 Plettenberg bay (the sea ) is full of dolphins, whales and other sea life. From the windows and from the sand dunes that line the beaches you can look out onto the bay and see the dolphins playing in the waves. There are hundreds of them swimming and jumping out of the water only to fall back again and do it all over again. Every year around the end of June beginning of July the sardines make their run up the coastline and the dolphins havea feast. You can see them chasing the shoals from the land. To the east of the Beacon Isle hotel is a small bay where the local Calamari fishermen anchor their boats . It is interesting to watch them come ashore . While we were in Plettenberg bay the weather was not so good and the sea was quite rough. The boats are anchored quite near the shore and in the surf line. It was quite scary to watch them taking on the breaking waves side on. On the beachfront there is a restaurant where one can sneak in for a quick beer if the beach gets too much for you. It has an upstairs deck which looks out over the bay. Just around the rocky outcrop which forms the eastern boundary of this little bay is the Blue flag beach of Lookout. It is this beach that is being threatened by the Keurbooms River. Its a lovely little beach with a restaurant and oblutions and is very popular with the younger set. The waves off Lookout Beach are good and many surfers use the beach to reach the waves. To the west of the Beacon Isle hotel is a beautiful clean sandy beach . It runs for a number of kilometres around the bay until it reaches the Robberg Peninsula in the west. This beach is protected by a long line of sand dunes which run the length of the beach just above the highwater mark. The sand dunes are covered in fynbos vegetation. To protect the dunes and curb erosion by people climbing them wooden pathways have been erected along the dunes. One can walk for miles along these walkways and look down onto the beaches. It is along this section of beachfront that millionaires row has been built. The houses are huge, with three or four storeys and cost millions. These houses have boosted the prices of housing in the area so that even a small three bedroomed home costs over a million rand today. Walking along the walkways looking at the houses it struck home that about 90% of the houses were unoccupied. Yes they were furnished but were all locked up and nobody home. Most people have built these massive mansions as holiday homes and only occupy them on long weekends or over Christmas. It must make life for the shopkeepers in the village quite difficult. You cannot make a living in a ghost town. Of late there have been a number of improvements in town. A hospital has been built near the entrance to the town, where before the closest medical facility was in Knysna about 30 kilometes away. A large shopping mall has also been built on the outskirts of the town to the east and features one or two of the larger chain stores one finds in the cities in SA. This mall has been built on relatively low ground and although built about a kilometre away from the banks of the Keurbooms river might be effected by the flooding that might occur when the river mouth moves westward over the next couple of years. I would imagine that all eventualities would have been planned for but who knows. Even with all the possible negatives mentioned in this article Plettenberg Bay still remains one of the jewels along the south coast of South Africa. It has so much to offer the visitor and really must not be missed when you visit South Africa.